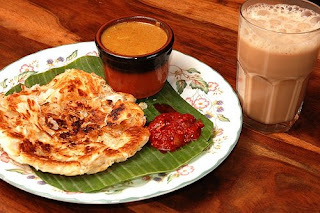 There are lots of Indian flat breads like parata and naan but roti canai is purely a Malaysian product. Also called flying bread, it is one of the most popular coffee shop dishes. Teh tarik, made from black tea and condensed milk, is found in Malaysia, Singapore and Brunei. Translated, it means "pulled tea" in Bahasa Malaysia. No doubt the name was inspired by the way tea makers pour the drink from great heights to mix it well. i will try that at my home.